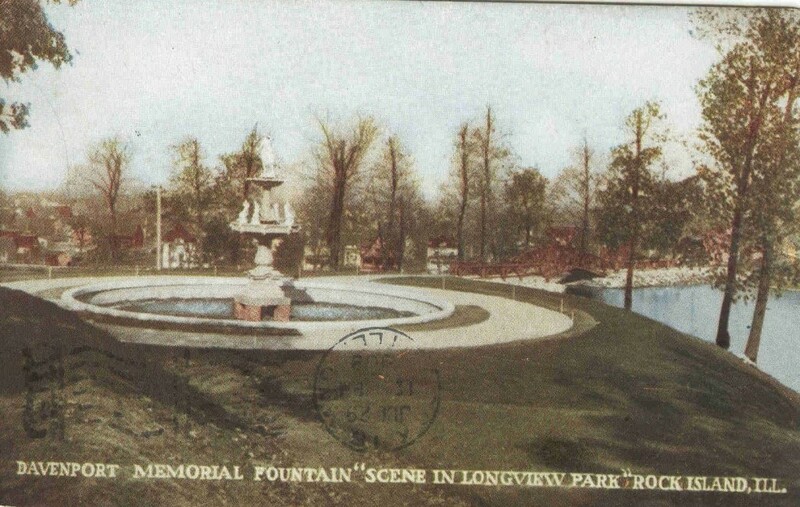 After being planned and under construction for years, by July 10, 1908, Longview Park, then called Long View, was complete enough for its formal dedication. A crowd estimated at 15,000 attended the ceremony, with many speeches and presentations. The event was centered in the area shown on these two postcards. These forty acres in the heart of Rock Island weren’t always a park. For decades they were owned by Bailey Davenport and used as his pasture, although Mr. Davenport did allow some public uses, from a small burying ground to occasional circuses. After he died in 1890, the pasture and his other real estate was sold. A group of local businessmen purchased the pasture, intending to develop it. However they were convinced by Mayor Thomas J. Medill to donate a part of their holdings to the city for a park. This still left the investors with a large area north of 13th Avenue for development. An association to develop the park was formed in June, 1902. The group soon hired O. C. Simonds, a noted Chicago landscape designer, to convert the pasture to a landscape suitable for a park. Trained as a civil engineer, Simonds also had an artistic sensibility that served him well, ultimately leading to his reputation as a preeminent Prairie school designer. Simonds’ style shares many characteristics with another noted Prairie school landscape designer, Jens Jensen, who would soon design the grounds of Suzanne Denkmann’s new home, now Hauberg Civic Center. Both used designs that retained rain water running off hilltop areas to create lagoons and streams. One of these postcards gives the name Rainbow Lake to Longview’s upper lagoon. These postcards show the important structures that framed that lagoon. Rainbow Lake was roughly trefoil in shape and was nestled at the foot of hill, just about where today’s waterslide is set. Likely it had a brick bottom like that of the now dry lower lagoon that remains today. There was a fountain spray at the center and the water’s edges were rimmed with large rocks. A tiny but picturesque gabled house was anchored in the easternmost lobe of the trefoil, ostensibly as shelter for the swans and Chinese geese that enjoyed the water. At the tip of the westernmost lobe, the lagoon overflowed to create a short but steep waterfall. The resulting stream meandered downhill and flowed beneath the road, the same road that remains today, until it entered the lower lagoon. 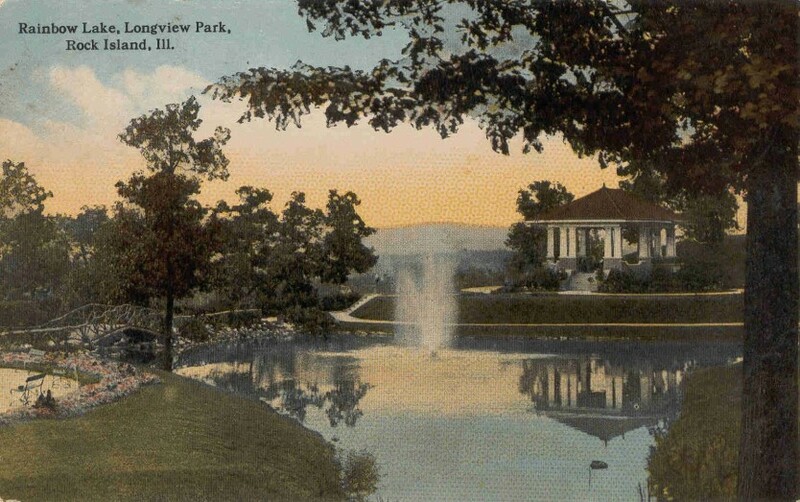 Just south of the long west lobe was the magnificent Davenport Memorial Fountain, shown on one postcard. Built during 1907, it was formally unveiled during the park dedication. Sisters Naomi and Catherine Davenport had donated $2000 for the fountain as a memorial to their childless Uncle Bailey. Considering that the park itself cost only $26,000, nearly equally shared between the city and private subscribers, the fountain was an expensive enhancement. Other community members also made donations of artifacts for the park, including a sundial from Henry Horst. B. D. Connolley, who presented the fountain to the city on behalf of the sisters, said that it would serve as a “lasting and fitting tribute and memorial to a man whose heart and hand were always open to the public.” The two-tiered stone fountain, which was topped by a statue of a woman holding her arm above her head, had smaller figures in the lower tier. It was centered in a large round basin that was encircled by a sidewalk. Other photos of the era show low flowering plants at the outer edge of the walk. North of the fountain was a rustic bridge that spanned Rainbow Lake’s outlet and beyond the bridge stood the counterpart to the fountain, the bandstand. Designed to serve the dual purpose of bandstand and pavilion, it is featured on many other postcards of the park. The open structure was octagonal in shape, with each corner supported by a pair of tapered white square columns atop a brick foundation. The roof was tile and a wide staircase faced the fountain. Like the fountain, it was centered within a round walkway. The bridge that linked these two features is exceptional in its own right. It is pictured to the right on the fountain postcard and at the left on the bandstand postcard. Railings to keep walkers safe from the edge of the lake were constructed of intricately laced tree branches. An arched central portion spanned the outlet to the waterfall. When attorney William Jackson, sometimes called the father of Rock Island parks, addressed the crowd at the dedication, he talked of his future dreams for Longview. Among them was a café at the top of the Longview hill, which he believed would enhance the park experience. That goal was realized in 1917 when the new “inn,” which included a concession area, was built. It was designed by Frederich Ehrson of Reading, Pennsylvania, who specialized in picturesque Swiss cottages. The public soon referred to this building as the Chalet. The pictured features of central Longview Park were obliterated in the mid 1950s to make way for a swimming pool. More recently, the old pool was replaced with a new water park. This article, by Diane Oestreich, is slightly modified from the original that appeared in the Rock Island Argus and Moline Dispatch on December 21, 2003.